Research Day 2019 was themed Regenerate to present the topic of wound healing and tissue regeneration. 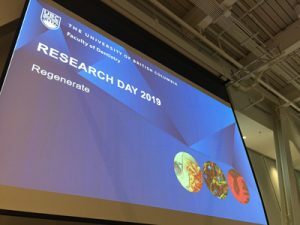 Now in its 12th year, UBC Dentistry’s annual Research Day, held on January 22, 2019, adopted a fresh and more engaging half-day format for the topic of wound healing and tissue regeneration. The aim this year was to provide more time for the audience to interact with researchers and to include a significant number of student presenters. In wound repair, the ultimate goal is to regenerate tissues to the same form and function that was present before injury. This requires reactivation of specific genes in particular cells that are relatively silent in resting tissues. During this activation process, the regulation of inflammation plays a key role in determining the healing rate and outcome. Hence the portmanteau title of the day, Regenerate. Researchers from the Department of Oral Biological & Medical Sciences in the UBC Faculty of Dentistry gave presentations about their research in soft tissue wound healing in the oral cavity (Dr. Hannu Larjava, professor) regenerative skin wound therapies with oral cells (Dr. Lari Häkkinen, professor), regulation of inflammation and wound healing (Dr. Christopher Overall, professor and Canada Research Chair in Proteases Proteomics & Systems Biology), and inhibition of bone erosion (Dr. Dieter Brömme, professor and Canada Research Chair in Proteases & Diseases). Reza Ahmadi (MSc/Perio year three), “The Role of Granzyme B in Periodontal Connective Tissue Degradation,” Dr. Hugh Kim, supervisor. Mohammed Alsaloum (MSc/Pros year three), “Fit of E-Max and Celtra Duo CEREC Crowns,” Dr. Nesrine Mostafa, supervisor. Ling-Yi Chen (third-year DMD), “CSF-1 Receptor Inhibition Results in Mouse Incisor Malformations,” Dr. Sid Vora, supervisor. Iris Feng (MSc year two), “Evaluating Access to Dental Care for People Living with HIV,” Dr. Leeann Donnelly, supervisor. Eleni Irinakis (MSc/Endo year three), “External Cervical Root Resorption: Determinants and Treatment Outcomes,” Dr. Markus Haapasalo, supervisor. Alexander Man (third-year DMD), “Regulation of Profibrotic TGF-β Signalling by CD26 in Skin Fibroblasts,” Dr. Lari Häkkinen, supervisor. Bryan Wong (MSC/Ped year three), “Retrospective Review of Biodentine Pulpotomy Outcomes in Primary Molars,” Dr. Kavita Mathu-Muju, supervisor. Cara Yu (MSc/Ped year three), “Positive Secular Changes in Dental Maturation Over a 30-Year Period,” Dr. Joy Richman, supervisor. First Place: Vanessa Johnson (BDSc year three), “Children’s Health and Oral Health Services in Northern British Columbia,” Dr. Leanne Donnelly, supervisor. Second Place: Michael Siarkowski (DMD year two), “The State-of-the-Art in Teaching Caries Control Agents,” Dr. Mario Brondani, supervisor. First Place: Ling-Yi Chen (DMD year three), “CSF-1 Receptor Inhibition Results in Mouse Incisor Malformations,” Dr. Sid Vora, supervisor. Second Place: Alexander Man (DMD year three), “Regulation of Profibrotic TGF-β Signalling by CD26 in Skin Fibroblasts,” Dr. Lari Hakkinen, supervisor. Second Place: Eleni Irinakis (MSc/Endo year three), “External Cervical Root Resorption: Determinants and Treatment Outcomes,” Dr. Markus Haapasalo, supervisor. First Place: Parisa Farmand (MSc/Endo year three), “Effects of Irrigation and Agitation on Apical Vapor Lock,” Dr. Markus Haapasalo, supervisor. Second Place: Mohamed Gebril (MSc/Pros year three), “Effect of Crown Cementation on Marginal Fit Using Micro-CT Measurement,” Dr. Chris Wyatt, supervisor. First Place: Walaa Ahmed (PhD/Pros year three), “Fit of Zirconia Crowns Using Different Preparation Designs and Sintering,” Dr. Ricardo Carvalho, supervisor. Second Place: Madhurima Datta (PhD year one), “Conducting Community Oral Cancer Screening Among South Asians in BC,” Dr. Denise Laronde, supervisor. Scroll through the photo slider to view photos from Research Day including the poster displays and lecture theatre. 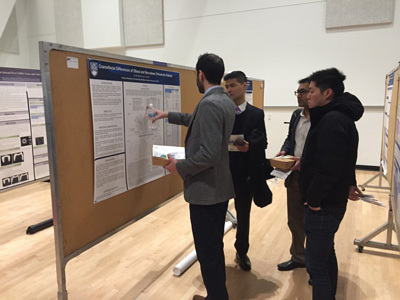 Research Day took place in the Great Hall of the Alma Mater Society Student Nest and was well attended by faculty, students and staff.